Subtitle: The New Jersey Plan. In this post, we’ll see why continuance under the Articles of Confederation (AC) was certain to destroy the Union. The commissions for delegates to the convention were, at most, slight variations of the wording of the report from the 1786 Annapolis convention, “to devise such further provisions as shall appear to them necessary to render the constitution of the Federal Government adequate to the exigencies of the Union.” It is on this clause that Article V opponents hang their collective hats. To them, entire state delegations intentionally disregarded their instructions to strictly stand by improvements to the AC. In a speech on May 29th, Virginia Governor Randolph spoke of the defects of the AC, the prospect of anarchy, and remedy in the establishment of an effective republican government which could defend itself against encroachment and be superior to the state constitutions. The Virginia Plan served as the starting point for debate, and would, in highly-modified form, emerge in September as our beloved Constitution. Its first resolution called for correction and enlargement of the AC to accomplish its purposes, namely, “common defense, security of liberty and general welfare” of the United States. To achieve these goals, the Virginia Plan would establish legislative, executive, and judicial branches that replaced the confederation congress with a republican form. In this sense, the Virginia plan did not amend the AC, but was instead, a bold departure from it. In the sixth resolution, the new national legislature was to have all the powers vested in congress by the AC. In this sense, the Virginia Plan was simply an improvement of the AC. Resolved that provision ought to be made for the amendment of the Articles of Union whensoever it shall seem necessary, and that the assent of the National Legislature ought not to be required thereto. Resolution thirteen evolved and emerged as Article V, which retained the right power of the sovereign people, via their states, to amend the Constitution. In Resolution thirteen, a scrap of federalism lived on in a plan largely designed to exterminate it. Small-state delegates from Connecticut, New York, New Jersey, Delaware, and Maryland led the fight to keep the AC, to preserve a union of states possessed of equal political rights. These men, spooked by the Virginia Plan, were willing to grant coercive authority to the AC, which would have been unthinkable just a year before. And not far from their consciousness was the old-time fear that the larger states would end up devouring the small.3 They weren’t against national features in an improved government, but were determined not to surrender significant power to the large states in proportion to population or wealth. Equality of state suffrage in the senate was a battle the small states could not afford to lose. Delaware’s commissions to her delegates read in part, “In determining Questions in the United States in Congress Assembled each State shall have one Vote.” On June 9th, New Jersey delegate William Patterson reminded the convention that the small states could not be forced to accept disagreeable terms, and would never join the plan as constituted. In a game of political chicken, he said he’d rather submit to a monarch or a despot than give up equal representation in the second branch.4 As of June 11, by a 6-5 vote, seats in the senate were still proportionally allocated. On this matter, the convention was at an impasse as each side waited for the other to blink. On June 13th, when practically the whole of the nationalist Virginia Plan had been adopted, Patterson asked for further time to present an alternative, which he did, on June 15th. The New Jersey Plan retained the confederation congress. Congress was to appoint one or multiple chief executives, who in turn were responsible for appointing judges to a judicial branch. Acts of Congress and Treaties were superior to state laws in The New Jersey Plan of government. If the governing structure of the two plans were diagrammed and held up side-by-side, the only significant difference was the lack of a House of Representatives in the New Jersey Plan. What the two plans shared were three branches; both were the supreme law of the land, and both (for the time being) relied on military enforcement of the law. Yet, the use of military force as a first resort would never do. It would so much as ensconce a guarantee of civil war in the frame of government! Recall the original AC reliance on voluntary compliance with congressional resolutions had proved to be impractical. On this point, the new and improved AC of the New Jersey Plan still acted only on the states. Try to imagine, as our Framers did, of invading federal armies to collect taxes! This feature of the New Jersey Plan, military enforcement of the law, made the confederated form unsuited and impossible for the United States. To avoid this, the supreme law must be ratified by, and act on the people. Therefore, the people required an institution of their own. Add a House of Representatives to the New Jersey Plan, and the convention would have likely reasoned itself to the same conclusion, our Constitution of government. Whereas the objectionable features of the Virginia Plan were eventually removed, there was no way around military coercion under the New Jersey Plan. Yes, the Constitution provides for military force in the ultimate necessity, but it is not the first resort. Conclusion. 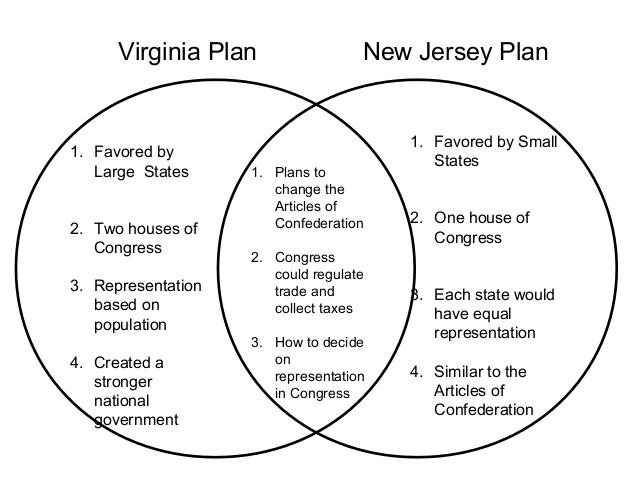 Debate surrounding the amended version of the AC, the New Jersey Plan, showed why continuing with a confederation of states would ultimately destroy the Union. Whereas the Virginia and New Jersey Plans, as submitted, were hostile to the people and states, our Framers used Natural Law, the law of reason to arrive at the best, most solicitous governing form ever devised. Today, we need not, as Governor Randolph lamented, “yield to despair.”9 It is our duty to restore their vision of free government. McLaughlin, A. C. (1905). The Confederation and the Constitution. New York: Harper and Brothers Publishers. p. 207. Madison, J. (1966). Notes of Debates in the Federal Convention of 1787. Chicago: Ohio University Press. p. 348. George Mason and others on July 23 elaborated why an AC ratified by state legislatures was inferior to Constitutions ratified by the sovereign people. Read more of this day for the debate over just who, the people or state legislatures, should decide ratification. Madison, June 16th. p. 129.